April 17, 2012, Vancouver, Canada. El Niño Ventures Inc. ("ELN" and the "Company") (TSX.V: ELN; OTCQX:ELNOF Frankfurt: E7Q) is pleased to announce the filing on Sedar of an NI43‐101 Technical Report (the Report), including a new Mineral Resource Estimate for the Murray Brook polymetallic massive sulfide deposit in the Bathurst Mining camp, New Brunswick, Canada. The Mineral Resource Estimate was initially reported on February 28, 2012. The Report was prepared by P&E Mining Consultants Inc. and G.A.Harron and Associates Inc. and incorporated 60 vertical drill holes, totalling 10,327.5 metres that were drilled during the 2011 drilling program. The resource estimate, which includes explanatory footnotes, is tabulated below in Table 1. The resource estimate is based on various assumptions regarding mining methods, processing and metal recoveries, payable metal NSR credits and metal prices. This estimate makes no provision for capital costs to mine the deposit, nor mill the material mined, as resources are not reserves and the reader should not presume economic viability. As a further approximation the total metal content can be recalculated as a zinc equivalent (ZnEq), which would equate to 8.17% ZnEq for the Measured plus Indicated resources and 8.47% ZnEq for the Inferred resources, based on calculating the total NSR value of the constituent metals in the table above plus the smelting and shipping charges all divided by $14.05, which is the recovered value of 1% Zn. This initial NI43-101 compliant resource estimate, as provided above in Table 1 including explanatory footnotes, supercedes previous historic estimates which understated metal grades due to widely spaced drilling and incomplete metal assays. The Murray Brook Deposit remains open to the northwest and there is good potential to increase both tonnes and grade with additional exploration and infill drilling, respectively. Contained metal contents as calculated by El Niño Ventures Inc. are summarized below in Table 2. Votorantim is the Operator of the Murray Brook Project. In January 2011, ELN announced that it provided notice to Votorantim Metals Canada Inc. (Votorantim) to enter into a Participation Agreement on the Murray Brook polymetallic massive sulfide deposit situated in the Bathurst Mining Camp in New Brunswick, Canada. (See news release dated January 20, 2011). Under Votorantimʹs Option and Joint Venture Agreement with Murray Brook Minerals and Murray Brook Resources, both privately held companies, Votorantim can earn a 50% interest in the properties by funding $2,250,000 in exploration expenditures and making payments totalling $300,000 over a three year period that commenced November 1, 2010. Votorantim can earn an additional 20% interest in the properties by funding an additional $2,250,000 in exploration expenditures over an additional two year period. ELN has elected to enter into a participation agreement wherein it can earn 50% of Votorantim's interest by paying 50% of the costs incurred by Votorantim in the Option and Joint Venture Agreement. 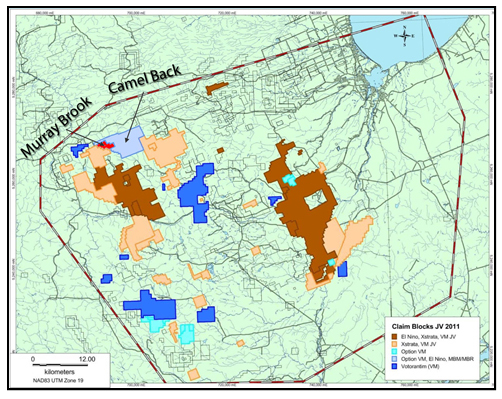 The Murray Brook deposit is a polymetallic, volcanic hosted massive‐sulfide deposit in the Bathurst Mining Camp, New Brunswick. The property is located approximately 60 km west of the town of Bathurst. A gravel road links the property to a paved highway. An electricity grid is nearby, as are communities with goods, services and skilled labor. The Gossan Zone overlying the massive sulfide deposit was mined for gold and silver during the open-pit mining operations carried out by Novagold Resources Inc. during the early 1990s. The hanging wall is moderately chloritic and is locally intensely deformed. The foot wall consists of fine grained, felsic tuff and tuffaceous sediments with moderate to strong chlorite and sericite alteration. Sulfides are mainly fine grained, massive, weakly laminated pyrite with disseminated and banded sphalerite, chalcopyrite and galena. Eugene Puritch, P.Eng., G.A.Harron, P.Eng, and Dr. William Stone Ph.D., P.Geo are Qualified Persons ("QP") for purposes of NI 43-101. Eugene Puritch and G.A.Harron are the Independent Qualified Persons as defined by NI 43-101 responsible for preparing the Resource Estimate presented above. Eugene Puritch and G.A.Harron are principals of P&E Mining Consultants Inc. and G.A.Harron and Associates Inc. respectively, and they are independent from the Companies as described in section 1.5 of NI 43-101. Table 2 of this press release has been reviewed and approved for technical content by Dr. William Stone, Ph.D., P.Geo. Executive Vice President of Exploration of El Niño Ventures. Eugene Puritch, P.Eng., G.A.Harron, P.Eng., and William Stone, P.Geo reviewed and approved the technical contents of this press release. Technical details in this news release were provided by VM Canada whose professional geologists conduct operations consistent with mineral industry best practices. VM Canada accepts no responsibility for this news release or any inferences made from the technical details provided herein. You can view the Previous News Releases item: Wed Apr 4, 2012, Early Warning News Release for Harry Barr, President and CEO of El Nino Ventures Inc.